Recorded in many forms including Hawthorn, Hawthorne, Hathorn, Haythorne, Hathorn, Heathorn and Hethron, this is an English topographical surname. Of medieval origins, it denotes residence at or by a bush or hedge of hawthorn. This was probably not as simple as it sounds, the 'hedge' was probably a defensive 'wall' not only to hold cattle in, but to keep marauders out! 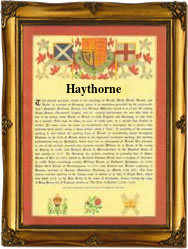 The name can be locational from the village of "Hawthorn" in County Durham. However spelt the derivation is from the Old English pre 7th Century word "haegporn" meaning "thorn used for making hedges and enclosures". The name development has included Henry atte Hauthorn of Worcester in the year 1327, Phillip Haythorn in the Subsidy Rools of the county of Surrey, in the year 1332, and Adrian Hawthorne of Oxordshire in 1551. Nathaniel Hawthorn (1804 - 1864), the American novelist and author of "The Scarlet Letter" and many other books, was a direct descendant of Major William Hathorne, one of the English puritans who settled in Massachusetts in 1630. The first recorded spelling of the family name is shown to be that of William de Hagethorn, and dated 1155. This was in the records of the Priory of Durham during the reign of King Henry 11nd of England, 1154 - 1189. Throughout the centuries, surnames in every country have continued to "develop" often leading to astonishing variants of the original spelling.